Sinuam na Halaan at Mais, Clam and Corn in Ginger Soup. Today I found this vacuum packed pre-cooked gourmet clams at a seafood shop. It is excessively costly but what the heck it’s been ages since we had halaan. I wanted a soup of halaan with corn kernels with ginger and lemongrass similar to Bisaya tinowa soup. Fresh sweet corns on cobs were available on my favourite supermarket but it was equally costly and it would end up an expensive lunch. In the end I have to settle for canned corn kernels. Frozen chili leaves are also available on one of the Filipino food shop here, again it was excessively exorbitant and they come in large package it’s not worth for its purpose as an alternative I will just use baby spinach and will use extra green chilli. The lemongrass was also expensive but I have one stalk siting in my fridge for some time. Use of lemongrass may be omitted if it’s not available. In some supermarket bottled chopped lemongrass are available but I have not tried them they may be good alternative for the expensive fresh one but that I have to try it in the future. 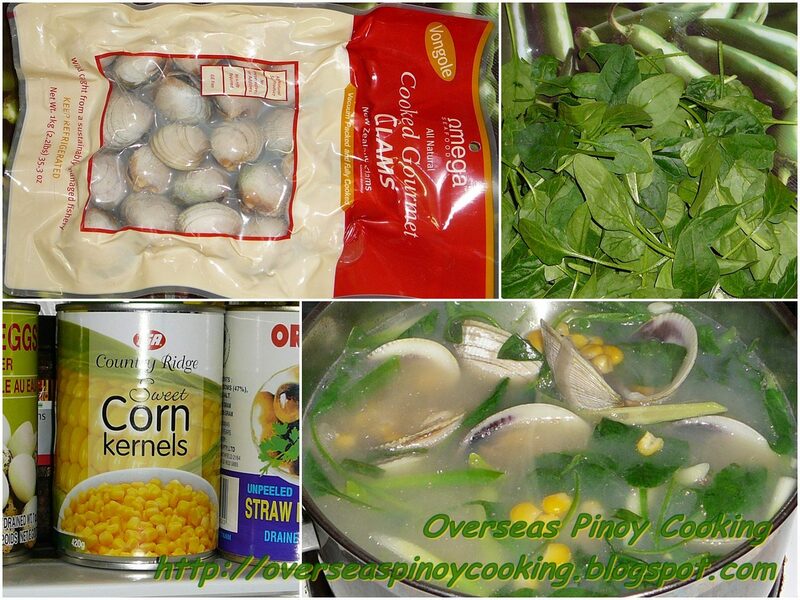 Okey here is the recipe of my Sinuam na Halaan at Mais, Clam and Corn in Ginger Soup. In a big pot suttee garlic, ginger and onion until fragrant. Add in the lemongrass, fish sauce, corn kernels including the broth and 3 to 4 cups of the reserve broth from boiling the clams, use water if it’s not enough. Bring to a boil and simmer for 10 to 15 minutes. Add in the clams and green chili, continue to simmer for 1 to 2 minutes. Correct saltiness if required. Add in the spring onion and bay spinach and cook for another minute serve immediately. only i want to find is halaan soup..